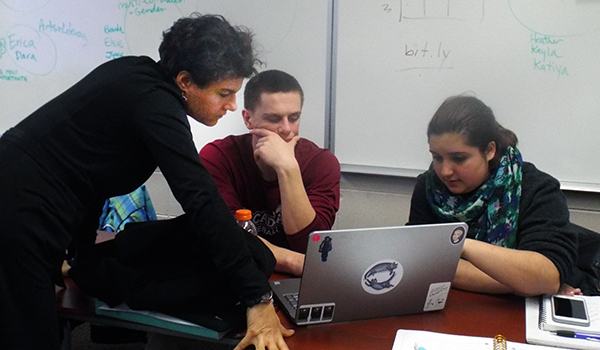 Kira J. Baker-Doyle, assistant professor of education at Arcadia University, and her colleagues designed Arcadia’s Connected Learning Certificate program so educators of all levels, from Kindergarten through graduate school, could build a network and teach and learn from each other. The program launched this fall and it’s driven by students who propose and select the content and topics of discussion. “The program embodies connected learning,” Baker-Doyle said. Connected learning is an educational approach designed for our ever-changing world. It leverages the advances of the digital age to make that dream a reality — connecting academics to interests, learners to inspiring peers and mentors, and educational goals to the higher order skills the new economy rewards. Six principles — interest-powered, production centered, peer supported, shared purpose, academically oriented and openly networked — define it and allow young people to experience learning that is social, participatory, interest-driven and relevant to the opportunities of our time. The following are answers to a few questions I recently asked Baker-Doyle about how she employs the principles of connected learning in her own teaching and as director of her university’s Literacies, Technologies and Citizenship Studies programs. Q: How do you define connected learning? When I explain connected learning to others, I start from where the concept came from: research on how young people are learning today in and outside of school. It’s easy for others to understand once I ask them what engages their children or young siblings or students outside of school. I’ll ask: “What do you see them doing that they are deeply engaged in, learning from, and drawn to because they enjoy it?” Oftentimes, they will mention things like, “Minecraft,” or “Rainbow Looms.” Then I might ask, “what are the characteristics of these activities?” They often point out: it is social, they are making, they are sharing, they have a shared purpose or goal, they are driven toward mastery of a subject or concept, and, quite frequently, they are using connected technologies to access resources and information and to share. It’s at that point that I tell them that they have just defined some of the basic principles of connected learning. In addition, those who teach and understand connected learning start from a critical awareness of social inequalities. We use the connected learning framework to design experiences in which these inequalities are addressed, whether by empowering marginalized youth through student-centered, real-world problem-solving or by fostering increased access to opportunities and resources using connected technologies. So, in addition to being about social, and authentic learning, connected learning also is about nurturing critical citizenship. One of the biggest changes in the 21st century has been the democratization of knowledge. Connected technologies have changed how we see who is an expert, what information we own, and ultimately, what we value as “knowledge.” Connected learning integrates what we know about how to engage learners within this new social paradigm, and is centered on building equity and opportunity for all learners. Q: Why did you create the Connected Learning Certificate program at Arcadia, and what’s it all about? The Connected Learning Certificate Program was initiated and designed collaboratively by a number of amazingly innovative teachers, researchers, and educators. I love the creation story itself, as it really reflects some of the central tenets of connected learning. The seed of the idea of a program began when Meenoo Rami and Christina Cantrill approached me separately with ideas about designing courses to teach at Arcadia’s School of Education. We had a big “visioning session” with a few other colleagues about how these courses might be linked — not only linked, but also how they could build and sustain a community. Our “Aha!” moment came when we realized that what we really wanted to do was build a network of learners, and let them drive the program. So, our program challenges the traditional higher education model in a fundamental way: instead of centering the program on the distribution of content, the program is centered on the cultivation of networks of learners, who share and drive content. I’ll give you a specific example. 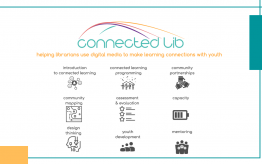 One aspect of our certificate program is called the “Connected Learning Camp.” Connected Learning Camps are one-credit, one-week long intensive courses on “hot topics” in connected learning (such as Wikipedia in education, open badges, or digital storytelling). The certificate is designed so that members of the Connected Learning Certificate community can propose (application here) and vote on potential new camps. Since we just started the certificate program this year, we are kicking off with the first two camps this spring (see here for more info on them), which we hope will generate interest in the idea. Another way the certificate program is different is that it is designed to be “institutionally distributed.” In other words, we can collaborate with other colleges and universities to offer similar courses that can feed into the program. 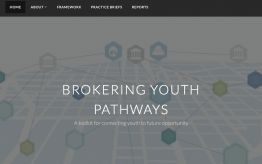 We have a wonderful board of advisors helping to think about how to do this, including Elyse Eidman-Aadahl, Bill Penuel, Antero Garcia, and Philipp Schmidt. I’m really looking forward to seeing the community grow and to support the development of a network of leaders in connected learning (a central goal of our program). Our certificate program requires 12 credits (180 hours) of courses in four areas: connected learning practices, connected learning theory and history, content focus, and technologies. At Arcadia, we offer “Teacher Practice in a Connected World” (taught by Meenoo Rami) “Seeking Equity in Connected and Networked Learning” (taught by Christina Cantrill), and two Connected Learning Camps this Spring: “Philadelphia: The City as Your Resource” (taught by Christopher Rodgers) and “Wikipedia for Educators” (taught by Karen Kohn). The content area course is selected from a variety of courses, based on a learner’s interest area. Q: What do your students gain from the program? Students are invited to become part of a community of leaders of connected learners through the certificate. So, it is not a once-and-done kind of experience. Rather, through initial participation in the courses, students become familiar with the discourses, practices, and stances of connected learning and, over time, become immersed in the culture and community of connected learners. The hope is that the graduates of the certificate come back to offer connected learning camps, continue to share their innovative practices and work, and feel like the community is of value to their ongoing professional development. Traditionally, people have thought schools of education offer classes only for K-12 teachers. However, this certificate program was designed for educators in all realms — anyone who works with learners (we intentionally use the words ‘learner’ and ‘educator’ here instead of ‘student’ and ‘teacher’ for that purpose). 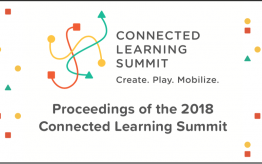 People who work in nonprofit organizations and need to design training programs, museum educators, health educators, coaches, consultants, and higher education instructors would all benefit from learning about connected learning. In fact, I believe that the more diverse a community is, the richer and more stimulating the ideas and discussions become.